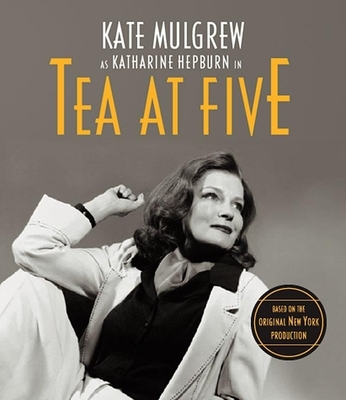 Tea at Five (CD-Audio) | The Drama Book Shop, Inc.
Kate Mulgrew as Katharine Hepburn in TEA AT FIVE has won standing ovations at each performance. The independent, intelligent, feisty Hepburn comes alive when Mulgrew slips deftly into the voice and being of the famous actress. The two-act play opens in 1938 when the actress is 31 years old and in the middle of a career slump. She is awaiting a call to see if she has won the part of Scarlet in a film called GONE WITH THE WIND. The story moved to 1983 when Parkinson's disease has left her voice shaking, her hand clutching a cane, but her eyes still shining with intelligence and wit. TEA AT FIVE is an unforgettable trip down Broadway, Hollywood Blvd, and memory lane. KATE MULGREW, best known as Captain Kathryn Janeway on Star Trek: Voyager, has been nominated for the 2003 Outer Critics Circle Award for Best Solo Performance and the 2003 Lucille Award for Outstanding Actress. MATTHEW LOMBARDO has written and directed many plays in New York and regionally throughout the U.S. His most recent credits include Mother and Child and Guilty Innoncence, serving both productions as playwright and director. Mr. Lombardo garnered a Writer's Guild Award Nomination for Outstanding Achievement. Kate Mulgrew, best known as Captain Kathryn Janeway on Star Trek: Voyager, has been nominated for the 2003 Outer Critics Circle Award for Best Solo Performance and the 2003 Lucille Award for Outstanding Actress.